One of my favorite things is the baby gate. It’s such an amazing invention. I have several of them. I move them around the house. I gate children out of rooms. I gate children in rooms. I gate off stairs and doorways and exits. It’s all about safety and peace of mind. Actually, it’s really about my sanity and having a moment to myself…….but anyway. I love baby gates. I use baby gates often during the school day. Today I made good use of a baby gate at the top of the stairs to keep the kids in the nearby hall where I could see them from the homeschool room. I was busily working on math with Tiger while all the girls played together. The peaceful sounds of play lasted only a few minutes. Then there was loud screaming. A door slammed. Then a second door slammed. I heard stomping feet, arguing, and then more screaming. I waited a few seconds and the rooms became quiet. The girls had separated themselves and were playing in different rooms. “Problem solved,” I thought. We moved on to the next math problem. Toddler 1 burst from behind a closed door with Toddler 2 in hot pursuit. “She bit me! She bit me! She needs to apologize!” Toddler 1 flops on the floor with a wail. Toddler 2 stands over her with a sly grin and then takes the tea cup from the play kitchen and drops it on her sister’s face. More screaming. Toddler 2 wisely turns and runs away. I charge for the gate and climb over in time to grab Toddler 2 and hug Toddler 1. A few minutes later the problem is resolved and everyone is happily playing again. It’s back to math for me. The older girls come out of the rooms and stand in the hallway arguing. I try to calmly remind them that no one can hear over their yelling, and it’s not like I’m trying to get any school done or anything. They take their dispute to another room. Toddler 2 runs into the hall with the tea pot. Toddler 1 is after her, reaching for the prized tea pot. They both charge toward the gate and Toddler 2 throws the tea pot in a high arc over the gate into the homeschool room. The tea pot hits a chair and little clear beads come raining out all over the floor and table. So, that’s where she hid all the beads when I was trying to clean them up yesterday. Not how I planned to find them……..
Toddler 1 is furious that she cannot have the tea pot. She slams into the gate like a battering ram, loosens one side of the gate, and comes back for another blow. With the second hit, the gate falls to the floor with a crash and Toddler 2 quickly climbs over her fallen sister to get over the gate and have possession of the tea pot yet again. This new mess takes even more time to clean. I put everyone back inside the gate and clean up the sparkly beads that now cover the entire floor. I put the tea pot in another room so it cannot cause any more arguments. I talk with the older girls and help them find a compromise. I give snacks to the toddler terrors and find an activity for them. I start to sit back at the school table with Tiger when Toddler 2 comes running to the gate holding both her snack cup and her sister’s snack cup. I run to the gate to rescue the stolen snack cup. As I lean over the gate to reach the cup, Toddler 2 lets loose with a stream of water all over my face. Apparently she had just taken a drink from her water bottle and thought I could use a bath. 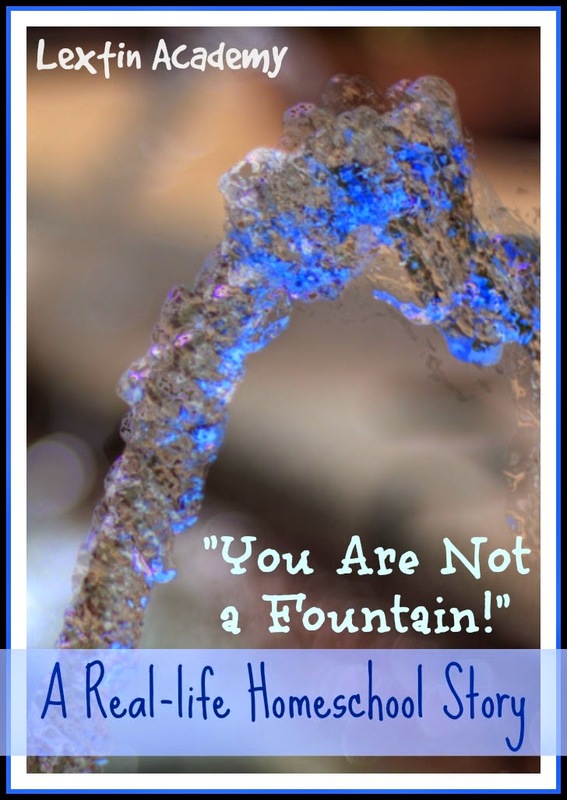 “You are not a fountain!! !” I yell in frustration as I stand there with water and pieces of Rice Chex dipping down my face. Tiger falls out of his chair from laughing. And then I give up hope that we will ever learn addition facts. I am clearly outnumbered and outgunned. It's nice to know that we all have chaos!